So well, I have been put on a lot of SSRIs as well as a lot of various anti depressants for the last couple of years. now I have started to take Nician for about 2 months ago and I personally find it to be a very good anti depressant combatant. I am currently on a 1,5 g dosage but I am planning on going up to twice as much which means that most likely I am going to be on 3 g per day. honestly, niacin is amazing, it has helped me very much this is why I am writing now this review. It is truly amazing and I am seriously recommend this thing to all of you people. what it is strange for me is that this product is not very well known and this shocks me a little bit, but then I’ve been thinking that maybe I’m one of the few lucky people who find it to be so beneficial? Anyway, I am not sure, what I am sure is that this product is worth a try. I would recommend you all to use niacin only after food, personally I am taking all of it (I mean all 1.5 g) after I work. I take 3 of them of 500 mg. after my work and after I eat, of course. I have also heard about niacinamide which is quite the same but not really. I mean, that thing does not make you flush (and this is the reason why I am going to take it during the mornings or day time but the thing is that it is only working for depression and as much as I’ve seen it doesn’t work for cholesterol as niacin is. I am thinking about trying out the Niaciname after I would run out of Niacin. By the way, I am living in the darkness – I mean, in the Norway :D this is why I am also taking vitamin D (here it is very recommended). Wow. I didn’t knew that niacin is able to treat psychiatric conditions too. this is truly an amazing thing and it seems that as much as I find about this thing, as better it gets. The other member said that niacin gave him flushes. That’s very good. that’s the real niacin. There are counterfeits of this thing and they are useless, but the real niacin it is the type that is giving you flushes. Even if that’s not an pleasant thing, it means that it is healthier and as you can see from the other review: it goes away when your body gets used to it. however, besides what other used has said, it is a very good thing at lowering cholesterol. You suffer from high cholesterol and you never knew about this? the reason is because they don’t want you to know about it. this thing is not 100% accepted, however there are studies that are proving that flushing niacin (the one that has been taken by the previous poster) is lowering LDL cholesterol very well (at least, much more better than the non flushing niacin). Either way, this thing is your typical flush niacin, but it is the cheapest niacin that I have ever purchased. 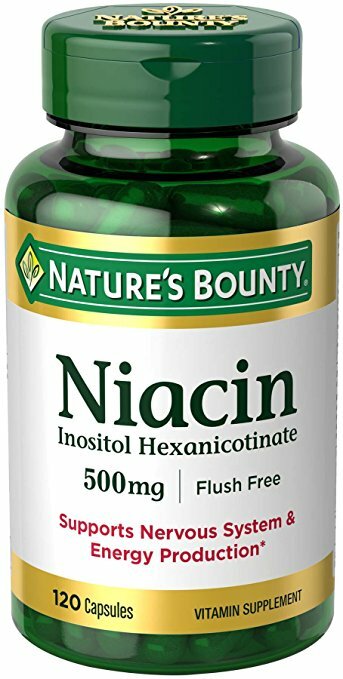 And yeah, as I said, it is pretty hard lately to find some real niacin (once again, by “REAL” niacin I am trying to say the niacin that it is not flush free). I personally have been spending lots of money on lowering cholesterol drugs. Even though they do work, they are having chemicals in them and what we get? An expensive drug that’s slowly killing us by taking it for a prolonged period of time, although it helps with high cholesterol. Hope you will find this review helpful because I also found about this thing by reading reviews. I have started to take Niacin 50 mg per day and then I have slowly increased until I have reached the dosage of 150 mg of it after each meal which is a total of 450 mg per day. so well, Rite Aid has been the only place where I could find that they are selling in 100 mg tablets that is why I am taking one full tablet and the other one I am taking with a pill cutter and I take one and a half pill after each meal. So well, my primary doc suggested me to take in lieu of statins for the elevated cholesterol, however, have yet to have blood test in order to check the efficacy of it. in the beginning I started to notice that I have flushes, however when my body has adjusted to the dosage well I have stopped flushing and I have also started noticing that I am much more calmer than how I used to be. you would never know due to the fact that I am a functional, successful and nervous wreck, however I have been fighting with a nervous condition that has caused me to have social anxiety and panic attacks, plus, because of this I have been suffering from insomnia for some years. The vitamin B3 has reduced very and very much and has ultimately controlled the social anxiety I’ve been having and honestly I cannot even express on how “normal person” I am feeling now that I have finally found and started to take it. when I have found out about this thing I have tried to do a research and guess what? I have found out that niacian has been used a lot of years ago in order to treat the psychiatric conditions like for example schizophrenia. Then it hit me: there is no impressive thing why big pharmaceutical companies never tell us about this thing: they would never benefit from it because it is a very inexpensive amazing supplement that helps a lot so they don’t want simple people like me and nearly everyone here to know about all of the uses of it. I am wondering what else supplements like this one are there that can help with other condition so well and that are very inexpensive like this one. I just really wished that I would have known about this stuff some years earlier.